Iona self-catering holidays on Scotland's West Coast - family accommodation. 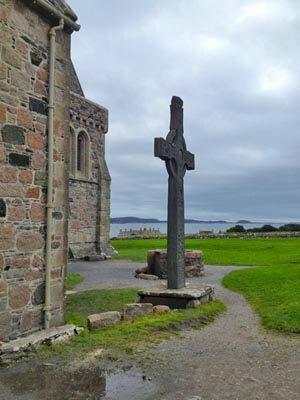 The tiny Holy Isle of Iona, now in the care of the National Trust for Scotland, has been a place of Christian pilgrimage and worship for over 1400 years as it was here that St Columba landed from Ireland in 563. The Book of Kells, now residing in Trinity College, Dublin, is believed to have been transcribed on Iona. There are no cars on the island, but if you can't walk far you can hire a horse-drawn carriage, which waits at the pier for people arriving on the ferry. Whilst no buildings survive from St Columba's time, the Abbey has been extensively rebuilt over the years and is a fascinating place to visit. Adjacent to the Abbey is a small chapel, believed to be the grave of St Columba. To the south of the Abbey is St Oran's Chapel, which is in the centre of the ancient graveyard, where not only Macbeth and Duncan are buried but numerous other kings of Scotland. A more modern grave that of John Smith former Leader of the UK Labour Party which is also situated on Iona. Iona is a magical, spiritual place and it is well advisable to rent a self-catering cottage or stay in a bed and breakfast accommodation as the best time to be on Iona is either early in the morning or in the evening, thus avoiding the day-trippers. Iona's sandy beaches are also worth seeking out for a bit of solitude. If you are staying in a holiday cottage on Iona then you can easily explore all parts of this most special of Scottish islands.